Tod Man Pla (or Tawd Mun Pla, Tod Mun Pla, Tod Mun Pla thanks to the madness of Thai-English transliteration which, of course, affects the name ทอดมัน or, when fish is used, ทอดมันปลา, here is one of the most prominent appetizers on most Thai restaurants’ menus. The longevity of this old-fashioned dish’s popularity speaks volumes about its greatness. Our family has a great recipe for Tod Man Pla which I can’t share lest my aunts and uncles smack me up the head next time I visit home. One of my aunts has a degree in culinary arts and her red curry paste recipe is the best I’ve ever had. Her curry paste combined with fresh water fish , Pla Grai (ปลากราย), makes for the best fish cakes. It’s one of those recipes that you just do not mess with; it’s already perfect. But the one I’m sharing here is about as close as can be to what I grew up with given the ingredients available outside of Thailand. The only remedy? Frozen prepared fish paste. Prepared fish paste, in 1.5-lb packages, should be available at any large Asian grocery stores in your area. They’re usually tucked away in the back of the freezer, though, so you will have to put some effort into looking for them. Be forewarned that it’s not a single ingredient; seasonings and fillers have already been mixed into it. Some brands have tapioca starch added. Some have salt and pepper added. And some even have egg whites. But when it comes to Tod Man Pla, the varying formulae make little difference. 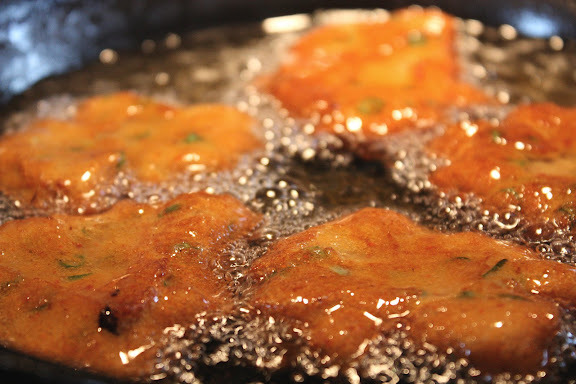 Good Thai fish cakes must be well-seasoned and have firm, bouncy texture. The seasoning part is easy. We just use prepared red curry paste (for those who look for a more difficult way to make Tod Man, you can make your own red curry paste). In fact, that’s the only thing I add to the prepared fish paste to season it. Chiffonade of fresh kaffir lime leaves and sliced Chinese long beans or regular green beans, are also added. But the secret is this: in order to replicate the texture of the traditional main ingredient, Pla Grai, some egg whites are added to the fish paste mixture. The albumin in the egg whites creates the elasticity characteristic of good Tod Man Pla. Then last but certainly not least, since the bouncy texture is everything, the fish paste must be whipped until it becomes very viscous. In my family we have an heirloom terra cotta bowl in which we stir Tod Man paste with a wooden spoon in the same direction for at least 20-30 minutes. Here in Chicago, I let my KitchenAid mixer and its paddle attachment do the work for me. I’m lazy. The fish cakes are best served immediately along with a bowl of cucumber relish. (But they can be frozen and thawed/reheated for later as well.) You can have these as an appetizer, but I eat my Tod Man with rice. Jasmine, of course. This is a recipe for classic Thai fish cakes as you will find on the streets of Bangkok as well as family restaurants and rice-curry shops. The post includes tips and tricks on how to make chewy, bouncy fish cakes using ingredients you can find in the US. Put the fish paste in a large mixing bowl. Add the egg whites and red curry paste and stir briskly with a wooden spoon until the mixture is homogeneous, thick, and sticky (you can also use a hand-held mixer or a heavy-duty stand mixer with the paddle attachment to mix the fish paste). This should take about 30 minutes by hand or 5-8 minutes on high with a machine. Once the paste becomes very sticky, fold in the kaffir limes leaves and sliced long beans. Heat up vegetable oil in a small wok. You want at least 2-3 inches of oil in depth. Get yourself a bowl of water and place it close to the fish paste bowl. Your hands need to be wet — not just moist, but wet — in order to be able to form decent fish cakes without losing your sanity. The paste is very sticky. Once the oil is hot, form ¼ inch-thick rounds with roughly 2 inches in diameter and gently slide them into the oil. With a pair of wooden chopsticks or tongs, move the fish cakes around to allow for even browning. Once one side is golden brown (after 30-40 seconds), flip them. It should take a total of one minute or so to cook both sides. You know your fish cakes are done when you poke them lightly with the tips of the chopsticks and feel the bouncy resistance. At that point, transfer the fish cakes from the wok to a paper towel-lined plate. Repeat the process until all the paste is gone. Serve the fish cakes with cucumber relish as an appetizer or a main dish with rice. For the cucumber relish: (Mine is a cheater’s version. You don’t even have to make a vinaigrette for this. If you’re a Thai food fan, I assume you have some Thai sweet chilli sauce in the refrigerator. Just use that as the base of your cucumber relish.) Mix together ¾ cup Thai sweet chilli sauce, store-bought or homemade, ½ cup thinly sliced cucumber, 2 tablespoon finely chopped dry-roasted peanuts, 2 tablespoon coarsely-chopped cilantro leaves, and 3 tablespoon thinly sliced shallots or red onion. Keep chilled in a covered bowl. I love the shapes, especially stegosaurus and South America! It’s a shame about Einstein. 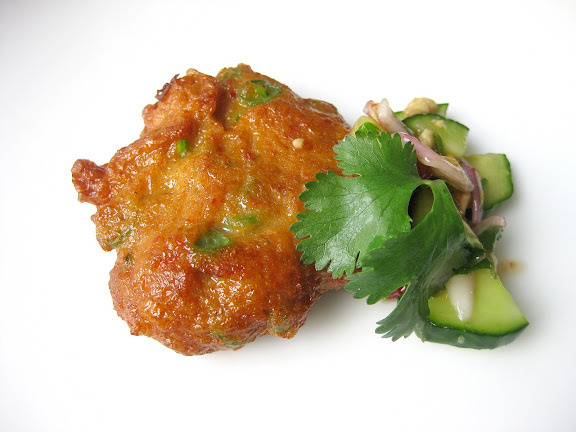 I love the special basil-y flavour and aroma in this Thai fish cake. Kobkoonkrub! Hahah nice shapes! What fun food art 🙂 Looks quite tasty too! Those cakes look just scrumptious and such cute shapes! Love this! I’m assuming based on your post that all Thai fish cakes made in the US are inferior to the Thai variety. What kind of fish do they use instead? I did a search on pla grai and could only find references to the fish back in Thailand, although I did see it looked like it was related to the infamous snake head and that we can get fresh in the States. Manggy and Oyster – I have no idea what to call Pla Grai in English or how to figure out what its scientific name is. Snake head fish *could* work, but it wouldn’t be an ideal substitute, though, because its flesh is more fluffy than firm and bouncy. The fish paste I use lists “ladyfish” (http://en.wikipedia.org/wiki/Ladyfish) as the main ingredient. Love the shapes, takes a creative eye to pick these out…stegosaurus a great match! As usual–every time I visit your site I immediately want to try whatever you’ve posted! These look delicious. HA! Your shapes are so funny. That South America and Ty Rex are spot on. Your talent transcends. That cucumber relish also sounds too good. Not everyone probably make perfectly round cakes then again it’s the same for yours! Your post made me feel more positive towards them now haha. Although I have no idea how this dish tastes, I’d just have them because of coolness. A-ha. I just got my mommy’s ways now. My son really really loves Thai fish cakes. We like them too, but it’s just so much cuter when a six year old is gobbling them down. And I think people are surprised by how easy they are to make. I’ve never had a fish cake but it looks delicious, will have to find them on a menu locally or make some too! Interesting recipe…fish cakes, very different from what I am used to…love the ingredients in it, must taste very yummie! Nice pictures! 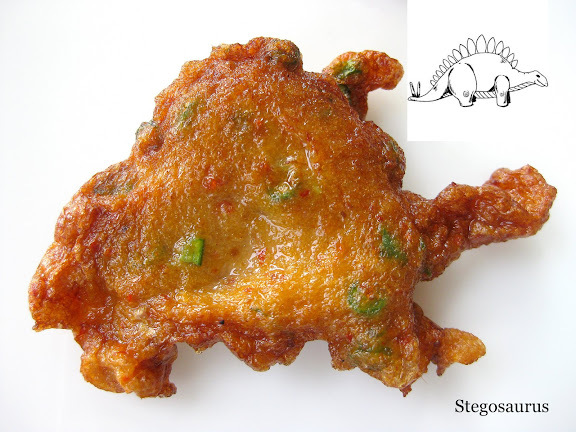 I was pretty excited about this recipe even before seeing those shapes — but stegosaurus? Are you kidding me? It’s a spitting image. Thai cuisine as we know it today traces its history back into the far past and has undergone numerous changes and adaptations. It nevertheless retains its distinctiveness which makes Thai food highly popular among connoisseurs of fine dining the world over. Thai food will certainly bring an even wider appreciation of its many delights. For Manggy, pla grai looks to be Chitala chitala ( featherback or clown knifefish). Apparently, they are popular as aquarium fish here in the US (info from http://bit.ly/FkXLc). Forget the fishmonger – looks like we have to go to the pet store or aquarium shop for this particular ingredient! TN – Thanks!! That fish you mentioned is exactly what Pla Grai is. I’m so glad I now know what other names it goes by. I have posted a part of your comment in the post for the edification of the general public. Thanks again. I love it when you guys add stuff like this to the comments. 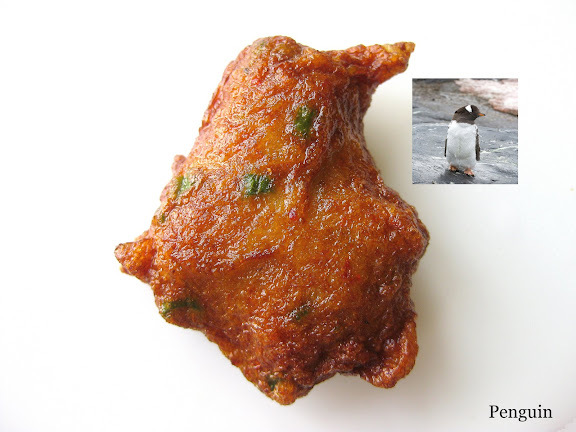 Can the fish cakes be frozen raw? And later thawed and fried or dropped into curry? Sally – Wonderful question! Thanks. Yes, you can do all those things. I’ve done that before. The texture is slightly less bouncy and firm, though not by much. The only disadvantage is that thawed fish cakes cause oil splattering, so you just have to be careful about that. Another alternative is to go head and fry the fish cakes fresh, freeze them, and reheat them in the microwave. I’ve tried that and liked this method as well. 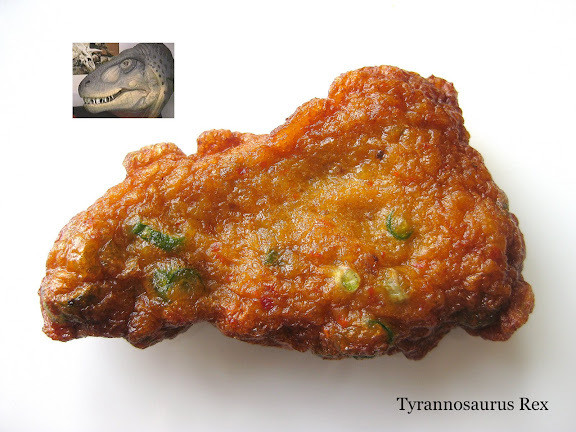 The disadvantage is that you don’t get the crispy bits around the edges that you get from freshly fried fish cakes. To use the fish paste in a curry, you don’t even need to do anything to it. The prepared fish paste is ready to use as is. Just thaw it, shape it, and use it as explained in my green curry post. You can also apply the tips mentioned above to fish balls. The species has been named “Khoratosuchus jintasakuli,” after Korat province, where the fossil was found. Shantihhh – Awesome! Thanks for telling me this. Just googled it and found this. So cool. My next batch of tod man will definitely include the big guy from Korat. – and lime zest instead of kaffir lime leaves. Also I cooked them in the oven for 20-25 minutes without oil. South America looks more like Africa to me. Bruce – Ouch. 😉 Thanks for the tip. I had an open container of AROY-D red curry paste so I used that instead of Maesri. It all came out great but was a little too salty. When I make this again I will definitely use Maesri Curry Paste as it has over 20% less salt according to the label content. It’s possible that the fresh Ladyfish paste I used was over salted by the supermarket when they prepared but I don’t have a lot of control over that. One question, if there is no starch in the paste I buy should I add tapioca to stiffen it? Next time, regardless of what fish paste-curry paste combination you end up with, try adding half of the curry paste the recipe calls for first, then cook a small portion (a tablespoon or so) in a microwave to see how it tastes. If more curry paste is needed, you can always add more. As far as potato starch, you can add some to the fish paste. I’d say 2 tablespoons per pound sounds about right. Hi, wld like to try this recipe. But i dont have red curry paste (nor green), so can I substitute with something else. (I dont have access to prepack Thai paste) where I live. Thanks. Chrissie – Unfortunately, no. Red curry paste is the main seasoning ingredient that defines these fish cakes (you can’t even use other types of curry paste). 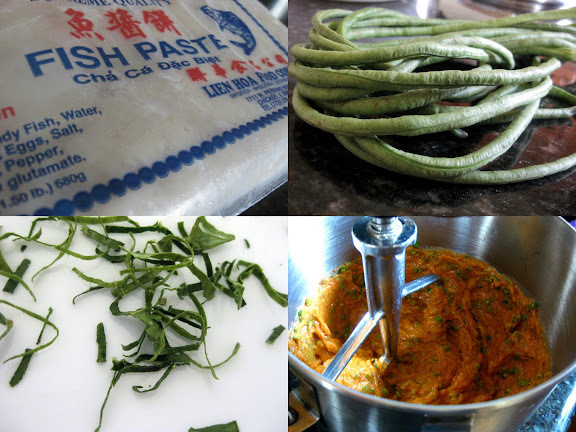 If prepared curry paste isn’t available where you are, you can make it from scratch. Can you find fresh ingredients like shrimp paste, lemonrass, kaffir limes, etc., though? If not, there is no way to make these shrimp cakes successfully. hi Leela, I wish to make fish paste myself because I can’t find it. Could you please give me some advice ? Thank you ! I still love your recepies, so detailled, and your sense humour. Lily – Thanks! Request noted. perhaps the secret recipe calls for roasted shrimp paste and fish sauce? Just one question. I live in a Spain and a wide variety of fresh fish and shellfish is readily available. What kind of fresh fish would you suggest for this? No fish paste available. If you give me a few names in English, I should be able to work out the nearest thing in local! I’d go for a firm white fish. Pollock, catfish, grouper, haddock, cod should work. Make sure to cut it into cubes and freeze the cubes until extremely cold (but not solid) before blending them in a food processor. For every pound of fish, you want to add 1 tablespoon of tapioca starch or cornstarch and 1 egg white to it. This increases the bouncy texture. My friends wife (Thai) gave me her recipe for Thai Fish Cakes. I met them in Kuwait while I was working there, He is Australian. She used shrimp paste with the kingfish (Mackrel) she had to work with in Kuwait. If you want I can send you the recipe complete with pictures they took while she was preparing the recipe for my benefit. Drop a line here as I have clicked on the notify me when new email is posted. She gave me the ingredient subistutes to use that I would be able to purchase outside of Thailand. Martha – Completely thawed. Best done overnight in the refrigerator. Defrosting in the microwave has never worked for me. Love the recipe, as I have loved all that I’ve cooked. 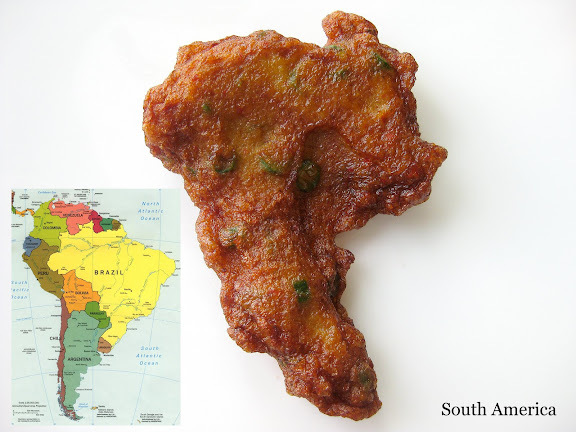 Had to say though, that South America looks more like an Africa to me. Made these with frozen pla grai (listed as “featherback”) fish paste finally tracked down in Manhattan Chinatown (Tan Ting-Hun Supermarket). Followed the recipe (KitchenAid method) with everything except the egg whites, and worked great! Going to try with an egg white or two next time and see if I get even better results.